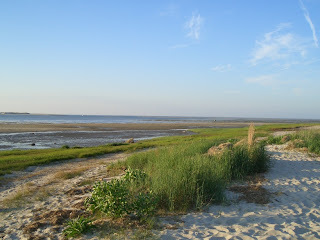 Yesterday, Angela and Guillaume went to the Cape, to her Aunt Andrea & Uncle Karl. Aunt Andrea is her dad's sister. They have lived on Cape Cod for many years. Guillaume drove. His driver's license finally came in the mail yesterday! He feels very legal now that he can buy beer at sporting events, like a hockey game! We made it to Cape Cod without incident. First, we went to the National Cemetery to visit Angela's dad. 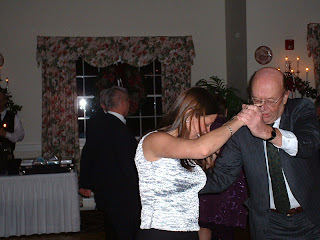 This is Angela and her dad at her cousin Pam's wedding in December 2002. He didn't leave the dance floor! We decided to go to Bone Hill Beach to see what it looks like in the winter. This is the little road on the way to the beach. It is just 2 minutes from Aunt Andrea & Uncle Karl's house. We drove up over the hill, and saw the beach in front of us. The camera didn't get blown off the post when we took this picture! This is the very same spot, in the summer, when we went with Cyrielle. It looks a lot warmer, doesn't it? But yesterday, Angela was freezing! They sat around that fireplace for a long, long time to warm up. In this picture is Angela, her Aunt Andrea (her dad's sister), Andrew, and her cousin Pam (from the wedding, picture up above). Pam's husband, Brian, and their two cute little girls, Jane and Addie, were there, too. The Rousseau Family met Brian when we were all in the North End, at Mike's Pastry, the night before Guillaume and Angela got married. Guillaume and Andrew were enjoying the fire, as well. And the food. The dogs were enjoying the company. This is Sam. And this is Ginger. Angela thought Ginger was dead, but she wasn't. She usually runs around and makes lots of noise. Aunt Andrea says it's hard to train her because she's smart. Sam (the black dog) is very well trained (we don't tell him he isn't very smart, but he may have overheard them talking). Angela and Guillaume were talking to the family when Guillaume noticed the pole to his right, and wondered what it was. It's called a bed warmer. In the "old days", people would put coal inside the bed warmer, and rub it on the sheets before they would get into bed so that the bed would be warm. Pretty interesting! We ate Pizza by Evan, 4 different kinds, and some salad. Brian had bought a case of Beaujolais Nouveau wine, and we had that too. It was very good. The bottles are very pretty, too, but for some strange reason, there are no pictures! The fire started to die down, the night was coming to an end, and Angela and Guillaume left shortly after Pam & Brian. Andrew decided to stay for the night because he had a 3 hour drive home to Connecticut! Guillaume had to ride his bike to work this morning at 10:30. It was very cold. Angela hopes he did not turn into an ice cube. Angela finished 7+ weeks of radiation last Wednesday, so she is going back to work on Monday. She is very excited, but is wondering when she will see Guillaume again. I think that it was great for you to come back to the Cape, Even if it was frozen I would be there with you just near the fireplace ! Guillaume, it seems you don't remember, but at Tata's home (our nany) there was a warmer bed as decoration !